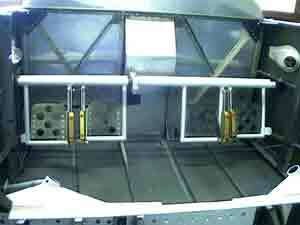 Here are the rudder pedals mounted near the firewall. Notice the hard points are below the horizontal stringer. I initially liked em lower. But after hooking up the cables to a bungee cord like so..
And spending some time in the cockpit playing with them. I decided above the rail was better. BTW, the plans say above the rail so this was another occasion where outsmarting the plans didn't work. Left picture is below the rail, right is above. Notice my feet sit a bit lower on the pedals on the right picture. Its a personal preference thing. Also I formed a rudder cable fairing in the tail. Made from .025 aluminum, pvc pipe to bend around, and a hammer. It was easy and really cleans up the exit of the rudder cable in the tail.